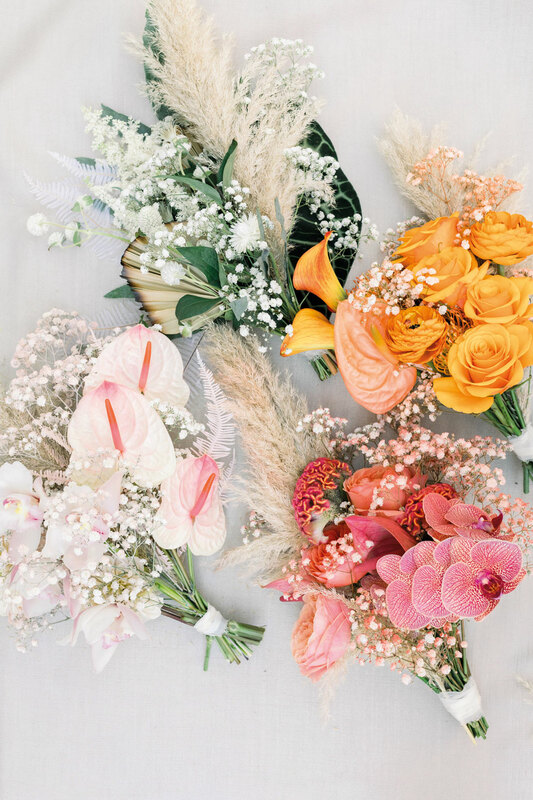 From floral accessories to couture bouquets: Rethink your bridal party florals with these creative, seasonally inspired and oh-so-beautiful designs by four Southern California florists. of a single variety in a delicate, round shape. 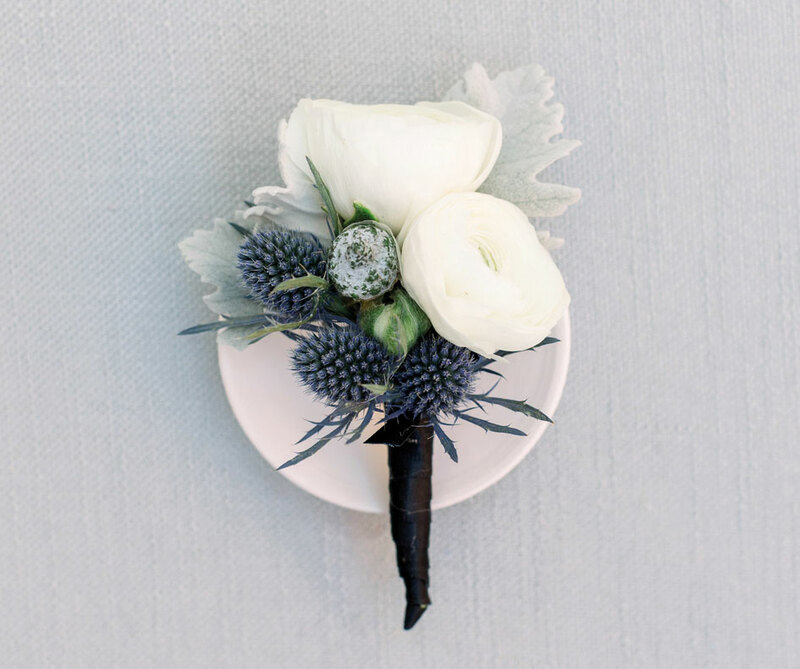 Chic, minimal bouquets make a maximum impact. 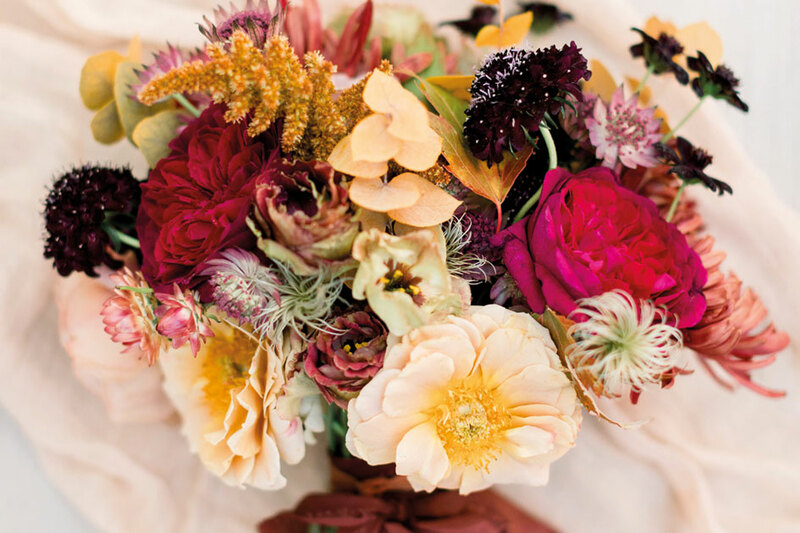 The Bloemist arranged this whimsical, bloom-heavy bouquet by incorporating the flowers found in the bridesmaids’ bouquets, clematis, astrantia and strawflower, and then upping the wow factor with California garden roses, scabiosa, gold Amaranthus, chocolate cosmos, eucalyptus and lisianthus. 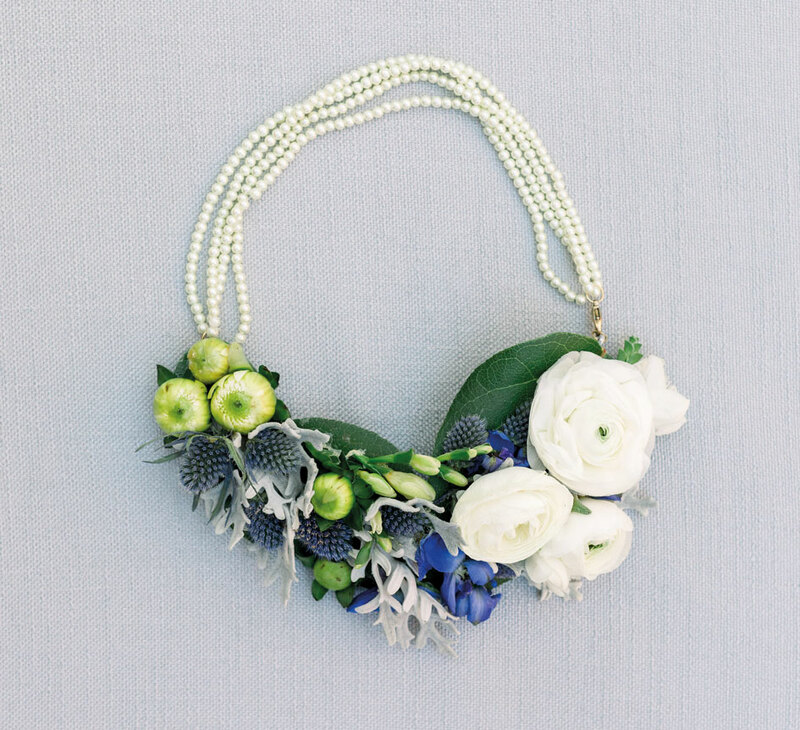 Dare to be different and opt for floral accessories in lieu of a traditional bouquet. 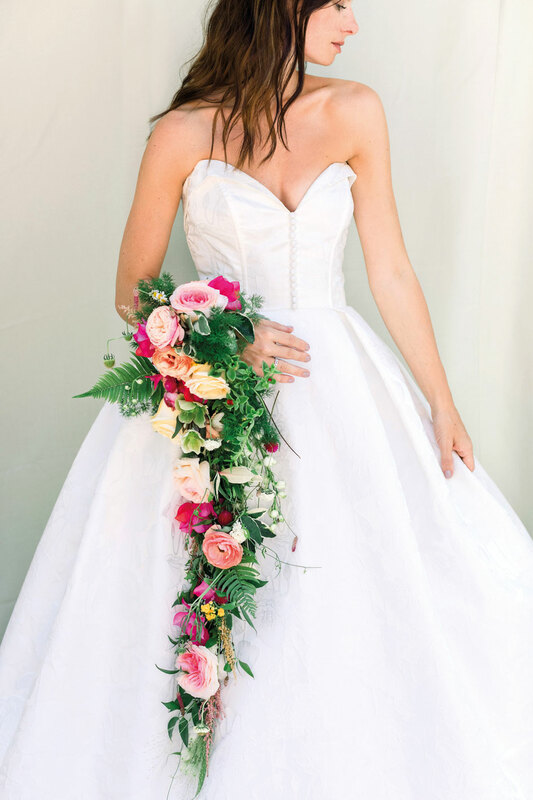 Westlake Village’s striking Lulu Collection, designed and crafted by XO Bloom owner Laila Ibrahim, makes a fashion statement as the members of the bridal party walk down the aisle. Wintry hues are embraced with soft whites, icy blues and dark greens. Adorn your bridal party with a mix-and-match collection of accessories, including a floral choker, shoes inspired by Francoise Weeks and XO Bloom’s exclusively designed Lulu wrap corsage. For the groom, keep it chic with a classic bouttoniere. 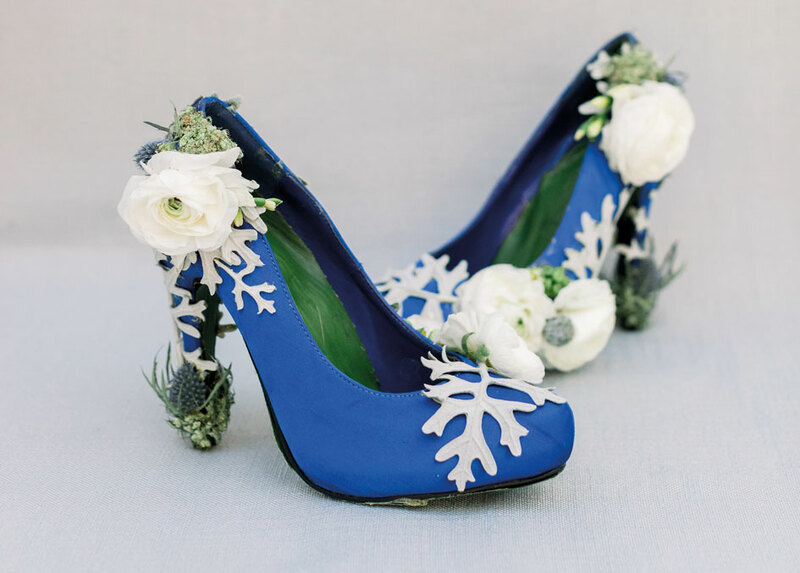 Each piece is designed with white spray roses, thistles, dahlias, ranunculus, eucalyptus, irises and delphiniums. A flawless match is Allison Webb’s “Kingsland” fit-to-flare bridal gown from JLM Couture Flagship Boutique in Los Angeles. 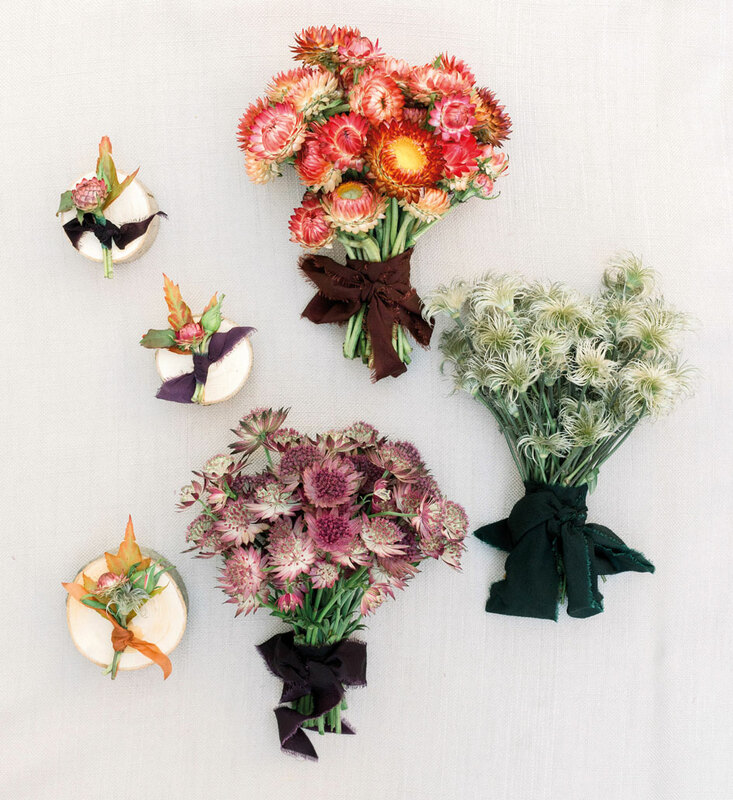 Keep the look cohesive by having the bridesmaids carry smaller, color-blocked versions of the bridal bouquet. 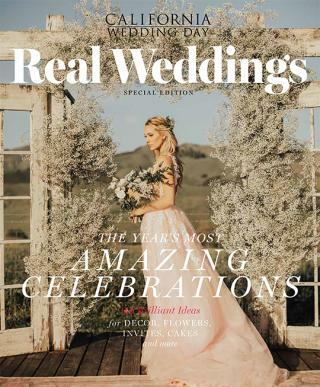 Baby’s breath plays a key role in these arrangements as Best Day Ever kisses the blooms with spray paint to complement the vividly hued blooms. 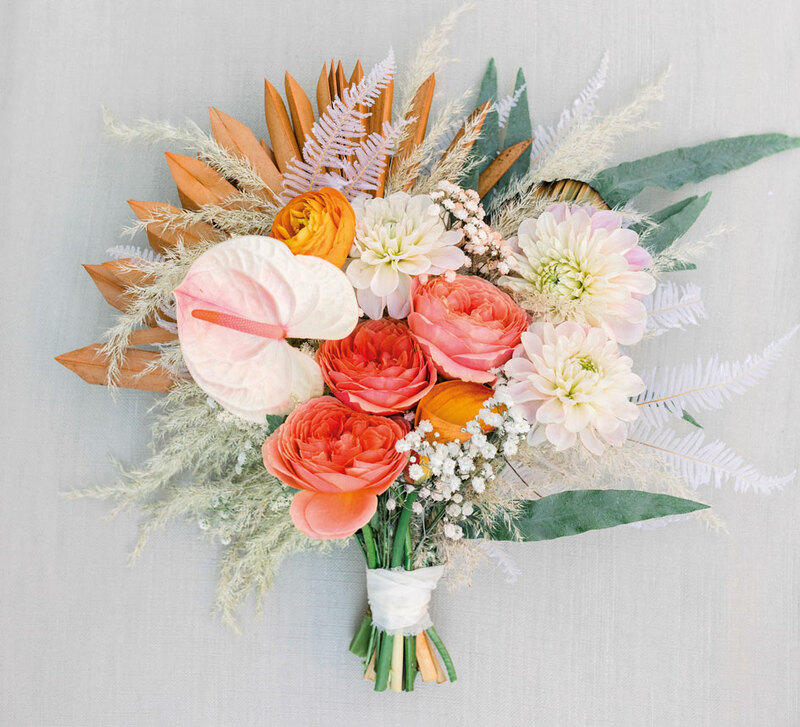 The bride’s bouquet unites the bridesmaid’s color blocking—blush, coral, papaya and evergreen—into one beautiful arrangement. Toby Kassoy of Santa Monica’s Lilla Bello ups the drama with a modern take on the cascading bouquet: a dramatic, bloom-imbued wrist piece. 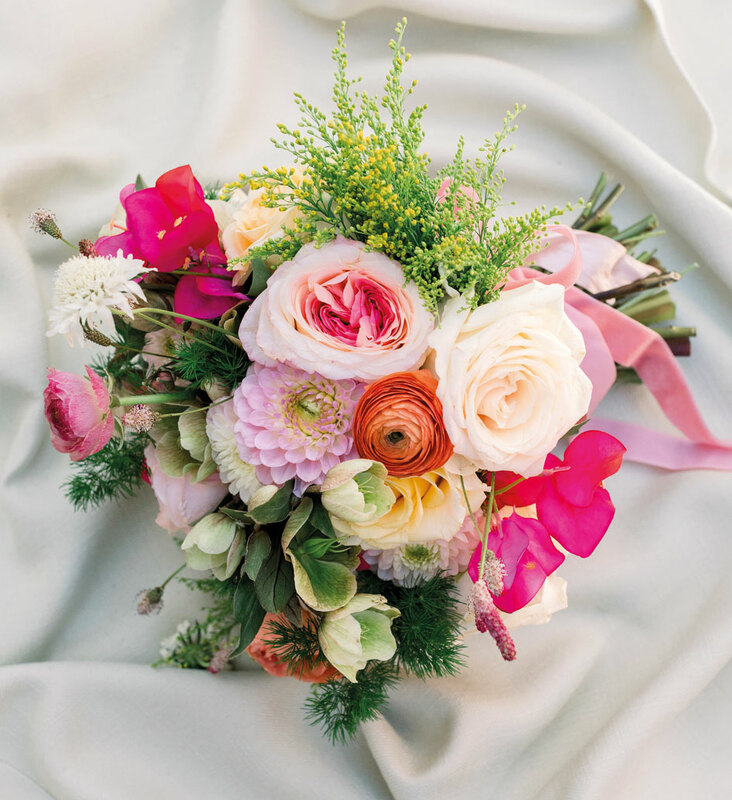 Inspired by meandering natural vines and garden flowers, Kassoy handcrafted the lightweight floral drape with delicately wired garden roses, ranunculus, bougainvillea, hellebores, clover, ferns and wildflowers. A perfect complement is Allison Webb’s Italian floral jacquard gown, “Clara,” from JLM Flagship Boutique in Los Angeles. bridesmaids’ and flower girl’s hair to complete the summer garden look. 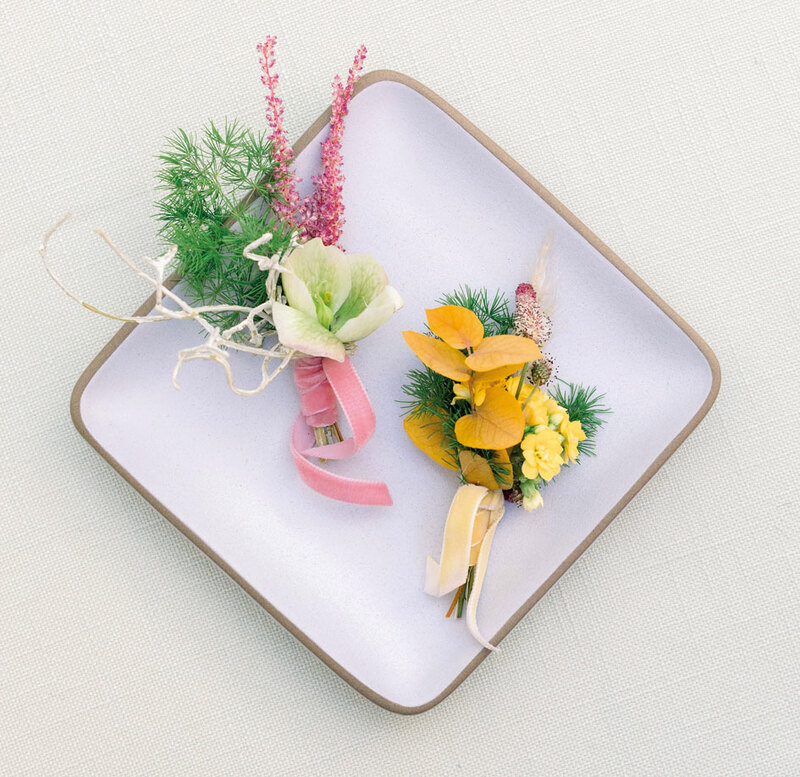 Instill a vibrant touch of summer to the groom’s attire with airy boutonnieres. Groomsmen’s flowers include hellebores, astilbe and Ming fern cinched in pink velvet. 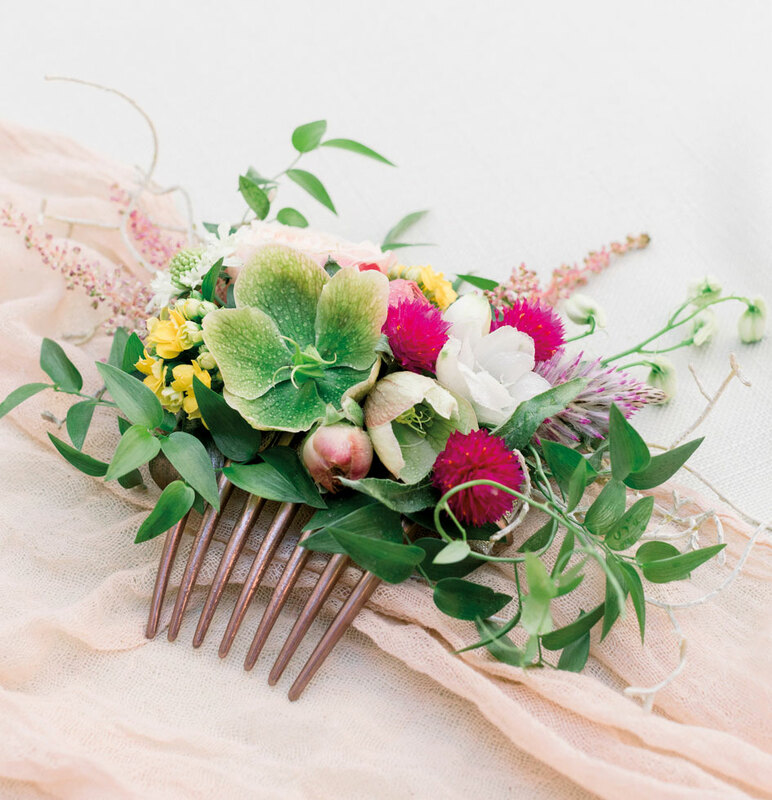 The groom’s boutonniere is created with kalanchoe, eucalyptus and pampas grass wrapped in a yellow velvet ribbon. Small bouquets of luxury flowers are back in style, thanks to Kate Middleton and Meghan Markle’s classic wedding florals. Our Best of 2018 Awards Gala at the historic Vibiana in downtown Los Angeles was an incredible night from start to finish.